Who wouldn’t want to spend the night inside a painting of a rustic garret that once belonged to a suicidal Dutch post-impressionist? 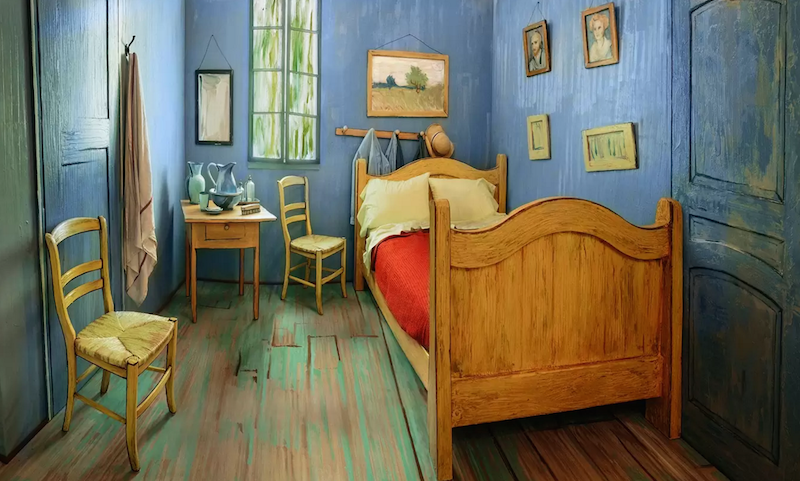 Via Time, the Art Institute of Chicago, promoting a retrospective titled Van Gogh’s Bedrooms, has partnered with Airbnb to offer this faithful recreation of Vincent Van Gogh’s “Bedroom in Arles.” The room has been constructed more to resemble the painting of itself rather than the actual room might have looked like, and is an amalgamation of the three extant versions of “Bedroom in Arles,” painted between 1888 and 1889. It looks cramped and creepy, but at only $10 a night, the Art Institute suspects it will be worth a lark to many museum goers. The rental is offsite in a doorman building in Chicago, but there will also be a “digitally enhanced reconstruction of his bedroom” installed at the show itself. Available dates will be announced soon, so get your $10 ready.